Mr Little’s Yetholm Gypsy is a distinctive and unique heritage potato with a name which summarises its historical connection to its original community. It has a unique colour with an eye­catching and distinctive red, white and blue patterned skin, and has a versatile flesh good for boiling, steaming and roasting. It has significant ties to the Scottish Borders town of Yetholm in terms of cultural heritage. The potato appears to have been kept in production almost by chance. It comes from the Borders town of Yetholm and was thought to have been introduced to the town in 1899, although it is not known for certain whether this variety was originally bred by gypsies or by a local gardener. It was however, acquired at a horse fair by its namesake ‘Mr Little’ who then apparently grew it in his family’s garden for the next 50 years, keeping the potato in production. 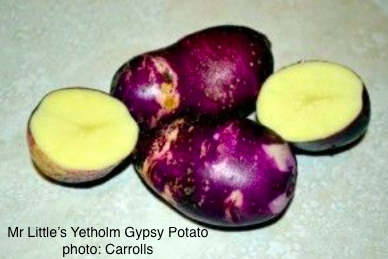 The potato variety was ‘discovered’ in 1998 by Alan Romans who got a tuber from the family, encouraged growth of it through his microplants project, and had the potato placed in the National Collection in 1999. It has a very distinctive appearance with a swirled red white and blue skin, appearing like a piebald variety. The DNA of Yetholm Gypsy has been tested by S.A.S.A. (Scottish Agricultural Science Agency) where it is held in their collection, and it has been found to be a variant of the King Edward potato. The taste and texture has been said to be similar to the King Edward. It has quite a thick skin with a pale creamy floury flesh and good flavour, described as sweet and earthy. They are suitable for either steaming or simmering or roasting, though care should be taken when cooking to stop them from potentially disintegrating and later on in the season, steaming may be preferable. The skin colour can fade on cooking and the potato has a cream flesh. The Yetholm Gypsy is said to be fairly slow to sprout, but seems to grow happily and yield well, though with yields which are possibly slightly lower than a modern variety. Tubers can be slightly smaller than modern varieties with some shape variation and occasionally ‘knobbly bits’. The plant’s leaves are small and dark green and have a pretty mauve flower. The plant is said to grow somewhat messily in many different directions. Despite its appearance at international heritage potato festivals and events, it is only currently commercially grown and marketed in Scotland by one producer, based right on the border of Scotland and England.